This is plate 31 of William Hodges' 'Select Views in India'. Ghazipur was the location of the East India Company's opium factories. 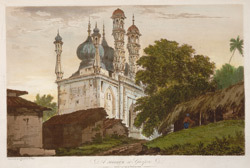 Hodges went there in 1781 to draw the city's mosque and its ruined palace on the banks of the Ganges. Hodges described the mosque: "It has great singularity, and I believe will hardly be considered by men of taste in Europe in any other light. The minarets are curious in their forms, particularly as we see the Corinthian capital lengthened and formed into the shaft of a column, and decorated with the same leaves. The swelling dome is certainly not a beauty; and however variety may be aimed at, verisimilitude never should be departed from."